The financial crisis has ratcheted up a dangerous notch. The currency markets have gone wonky. The authorities now have to make some pretty big and delicate moves — something like doing microsurgery on a plane in turbulent skies. The yen has risen by 40% against the euro since August, and 30% in October. In that month, the Australian dollar has fallen by 25% and the British pound by 16% against the US dollar. Changes of this scale are alarming in the stock market. They are petrifying in currency markets, because they make it virtually impossible to price exports or imports. What’s going on? Mainly, the pace of financial deleveraging is accelerating. In particular, currency carry trades — borrowing cheaply where interest rates are low, for example Japan, and lending where they are high, for example Australia or even the euro zone — are ending abruptly. The unwinding of these trades has jerked currencies around enough to provoke more margin calls for traders, amplifying the pressures. Then there is fear. Investors are selling currencies of countries that import foreign capital — precipitating currency crises in Eastern Europe and South Korea. The combination of deleveraging and fear has also pushed equity markets into something like a free fall. The Japanese Nikkei index is at its lowest since 1982, the MSCI index of non-Japanese Asian stocks is down 33% in October and Western stock markets are falling fast. While corporate credit, currencies and stocks are in trouble, government bonds are still strong. That’s a relief, since the markets are turning to the world’s governments to do something to stabilize inter-bank, inter-corporate and now, international cash flows. 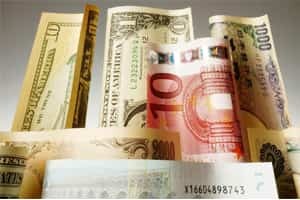 To stop the currency rot, the world’s governments will have to work together to set and then defend target exchange rates. That will probably require countries with big reserves of foreign currencies to deploy some of the cash for the greater global good, and overspending countries such as the US and the UK to accept devaluations and lower standards of living. It won’t be easy, but the alternative — a breakdown in the global trade system — is much worse.